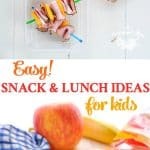 Home » What We're Eating » Easy Snack and Lunch Ideas for Kids! 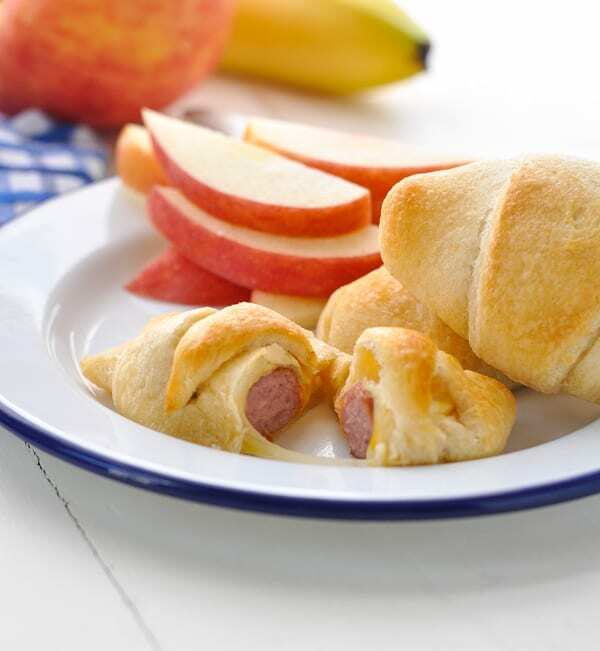 These easy, cheesy crescent dogs are a perfect after school snack for kids! 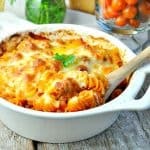 Thanks to my friends at Borden® Cheese for sponsoring this post. All thoughts and opinions are entirely my own! 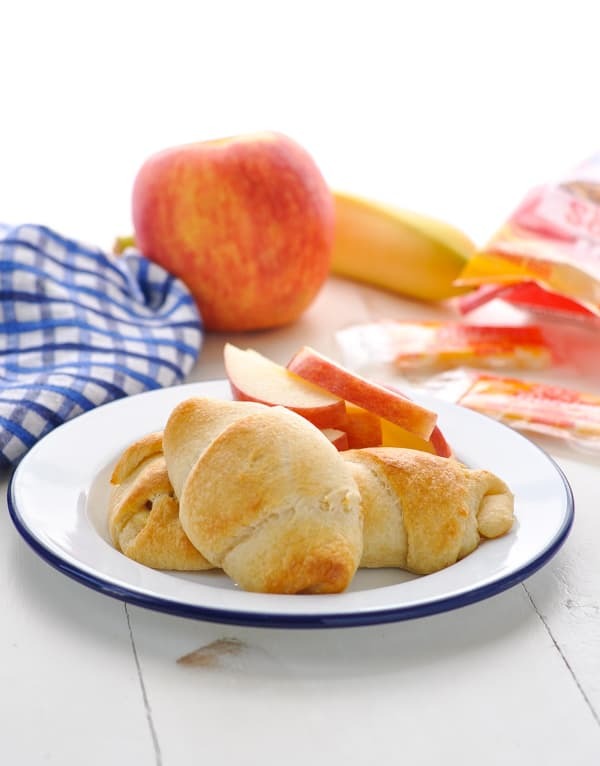 Back-to-school season is in full swing, and easy snack and lunch ideas for kids are in high demand! 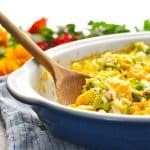 These simple, fast, and nourishing solutions take the stress out of feeding your family — and they taste delicious! 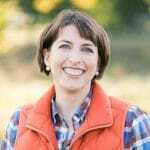 After just a few weeks of preparing lunches for my boys, I find that I fall into a rut of wrapping up the same old thing. I know that it’s boring to eat a turkey and cheese sandwich every single day, but on a rushed Monday morning, my creativity isn’t at its best. That’s why I pulled together a few new snack and lunch ideas to add to our rotation, which don’t require any extra thought, effort or time! 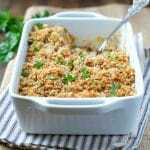 I’m sharing two lunches and two snacks here, but you can certainly mix and match different ingredients based on your child’s preferences. My goal is to include protein, carbohydrates, fats, produce, and usually a sweet treat in every lunchbox. 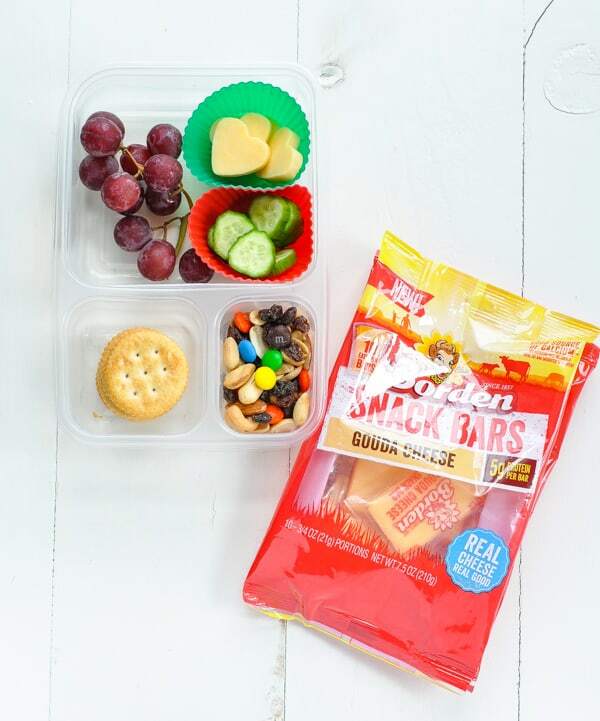 Protein-packed grab and go items — our new favorite is Borden® Cheese Snack Bars! 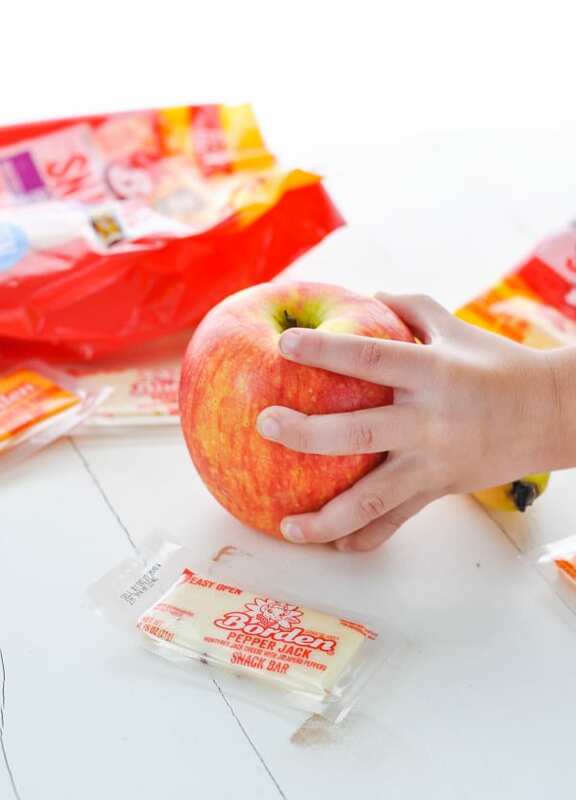 Borden® Cheese knows that sending kids off to school with a lunch that is equal parts fun and nutritious is important to moms and dads. As a mom, I like knowing that these Snack Bars fuel my family through whatever the day brings. Their convenient packaging is just a bonus! 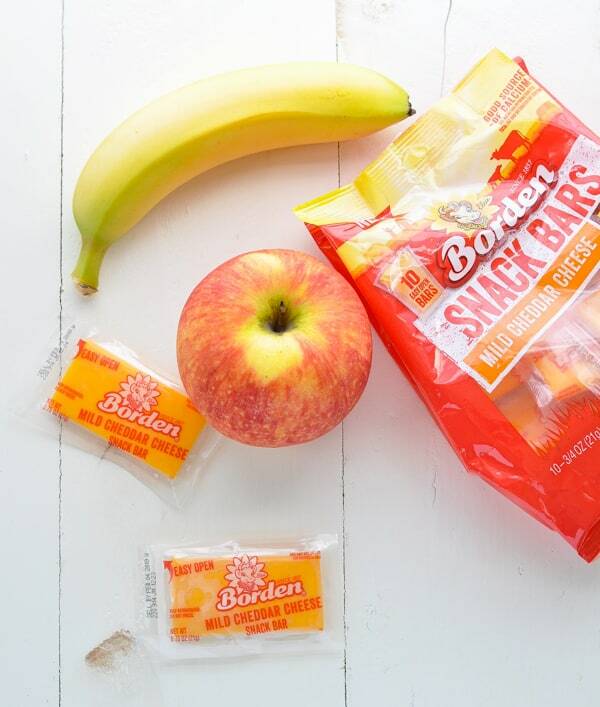 Borden® Cheese Snack Bars are sold in packs of individually-wrapped bars, perfect for tossing into a lunchbox, backpack or even briefcase for on-the-go snacking. I love the Pepper Jack flavor, while my kids are seriously obsessed with the Mild Cheddar flavor! 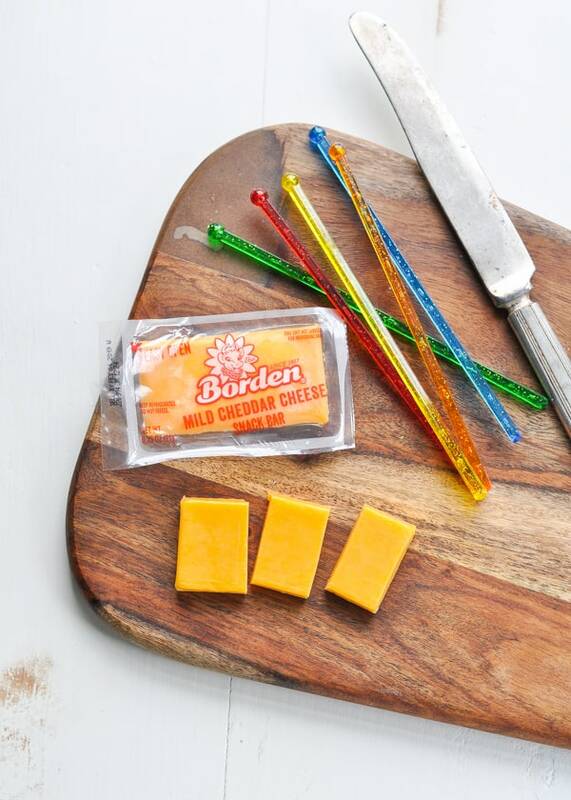 Lunch #1: Borden® Cheese Fun Shapes! Very early in my parenting journey, I learned that kids are much more likely to eat something if it’s cut into fun shapes. As a result, I’ve accumulated a variety of cute little cookie cutters that come in handy for much more than just cookies! Whether I’m using them to cut the crust off of sandwiches or to punch out cheese for school lunches, a whimsical shape is a guaranteed way to make a child smile. 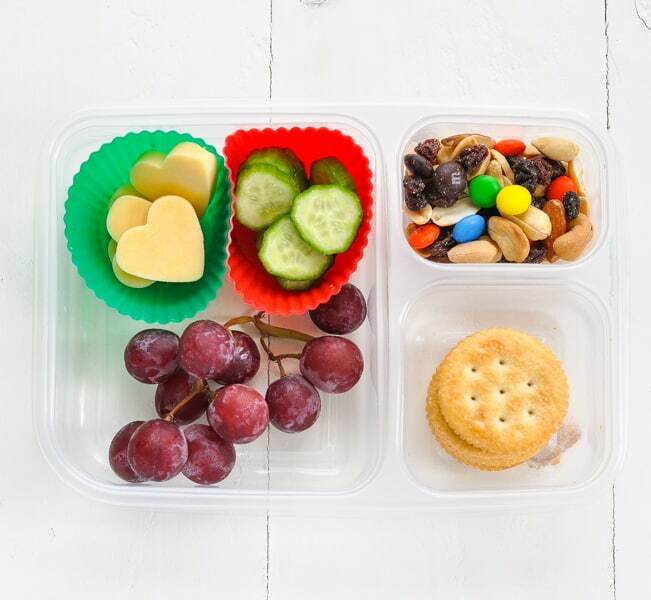 I used my little heart-shaped cookie cutters to add a sweet touch to this particular lunch idea, which includes cheese, crackers, grapes, cucumbers, and trail mix. 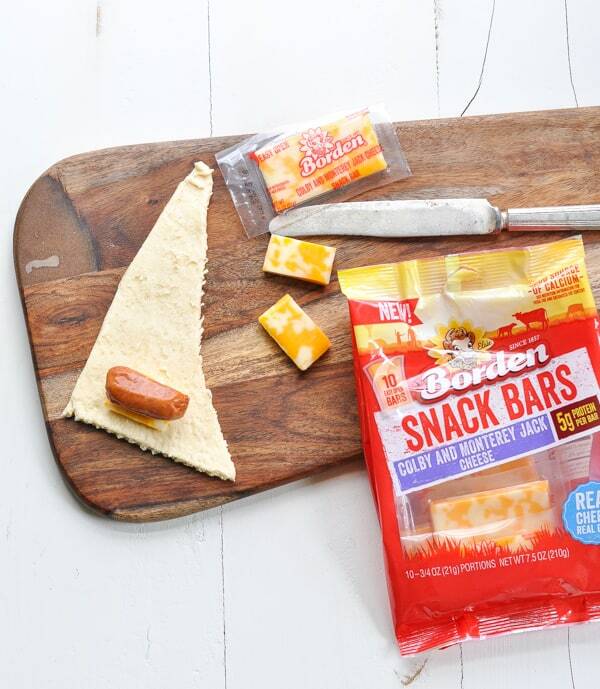 Just open up a couple of Borden® Cheese Snack Bars, pop out the shapes, and stash them in the lunchbox. It doesn’t take much time, but it sure adds a nice touch! 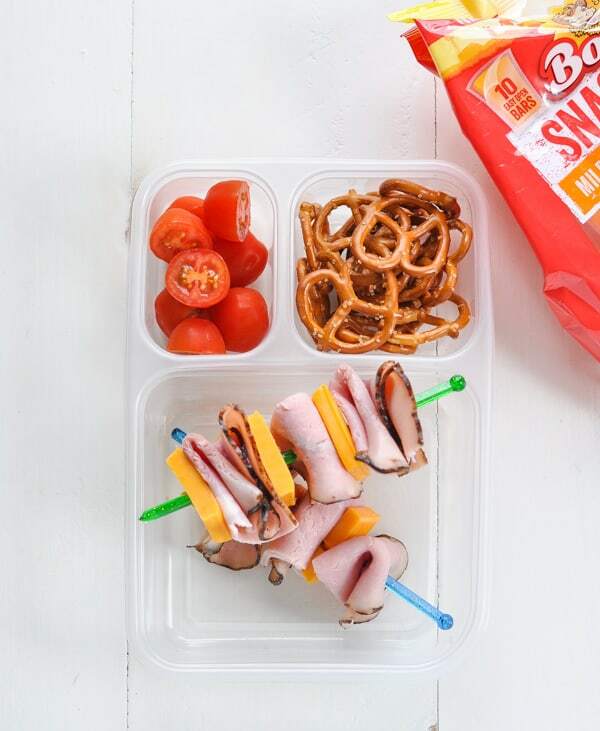 Lunch #2: Borden® Cheese Kabobs! When the kids are tired of sandwiches, assembling a few kabobs keeps lunchtime interesting — with no extra effort! There’s just something about eating off of a stick that kids LOVE! For this lunch idea, I like to use colorful plastic drink stirrers that I can find in almost any grocery store. They’re not sharp like traditional kabob skewers, so they’re perfectly safe for school. 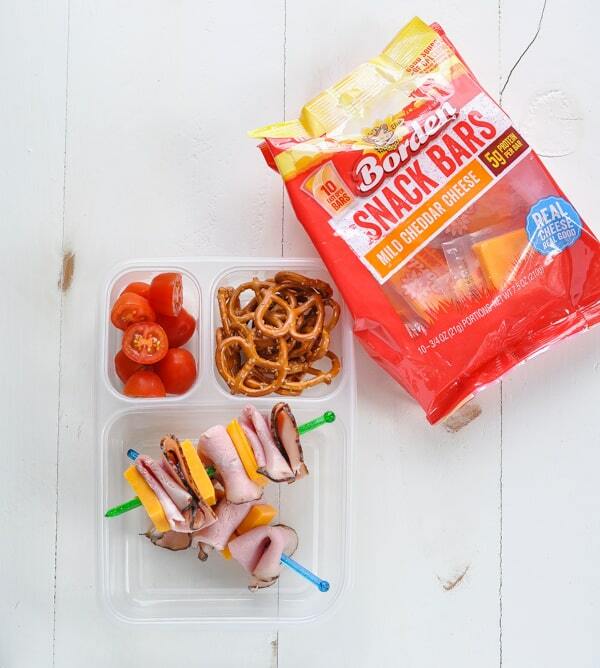 Simply slice a Borden® Cheese Snack Bar into thirds and thread the cheese onto a stick, alternating with your child’s favorite lunchmeat. 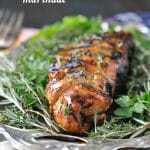 Again, it’s a fun twist on a classic combination! The boys always return home from school ravenous. Sometimes we’re running out the door to a soccer practice and we just need something that they can grab-and-go, while other days we sit down for a more substantial snack at the table. 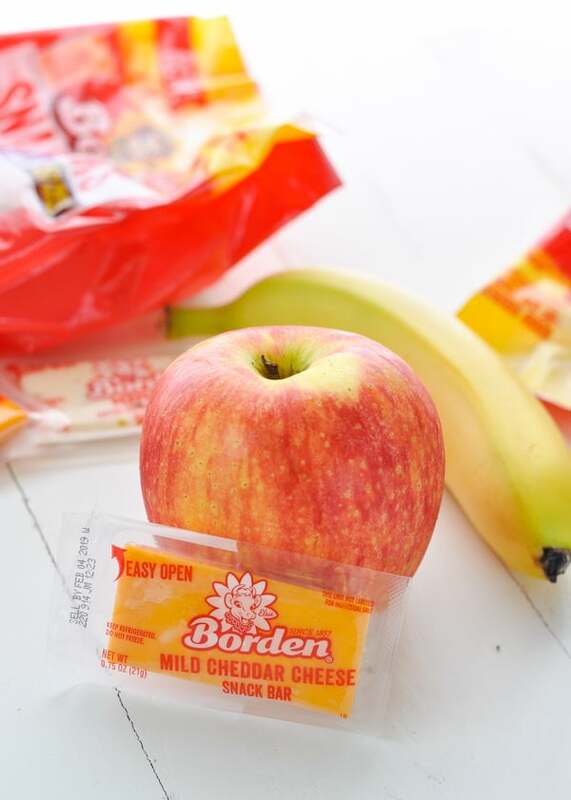 Snack #1: Borden® Cheese Grab-and-Go! With 5 grams of protein and 80 calories or less per serving, Borden® Cheese Snack Bars are a delicious and nutritious portable snack. 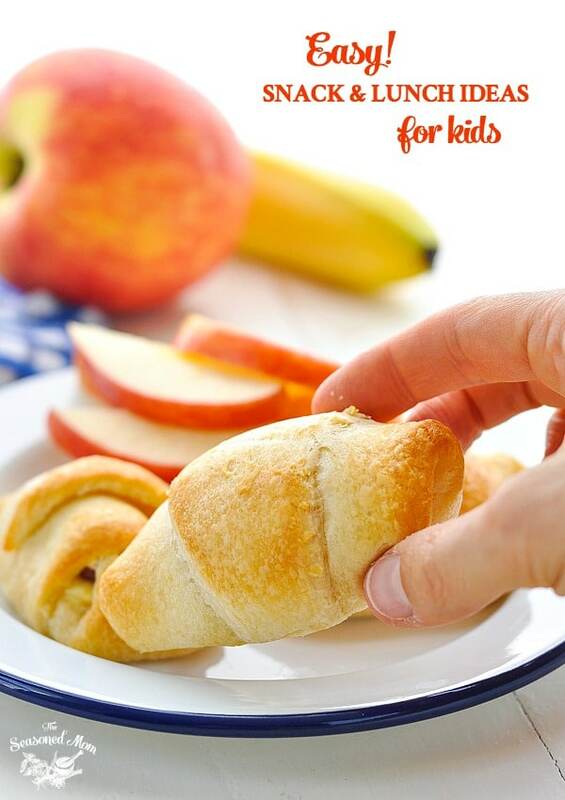 Pair the cheese with a piece of fruit and you’ve got a satisfying, delicious combination that will power your family through 2-hours on the sports fields! Snack #2: 3-Ingredient Cheesy Crescent Dogs! 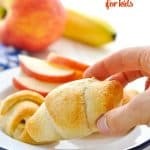 If you need a heartier snack to get your family through the afternoon, these cheesy “Pigs in a Blanket” are a simple, quick option that kids adore! 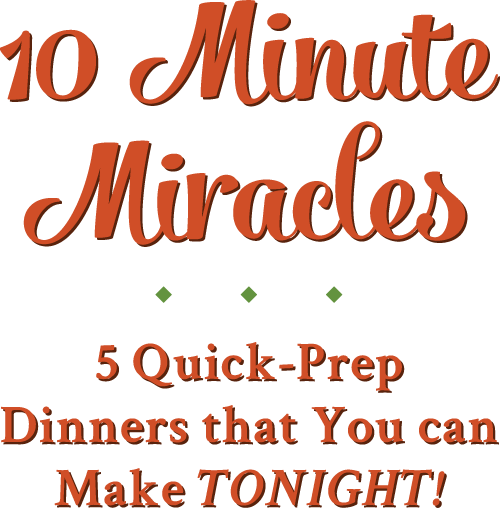 Best of all, they only require about 5 minutes of prep work and 10 minutes in the oven. So simple! First, unroll a tube of refrigerated crescent roll dough and separate the dough into 8 triangles. 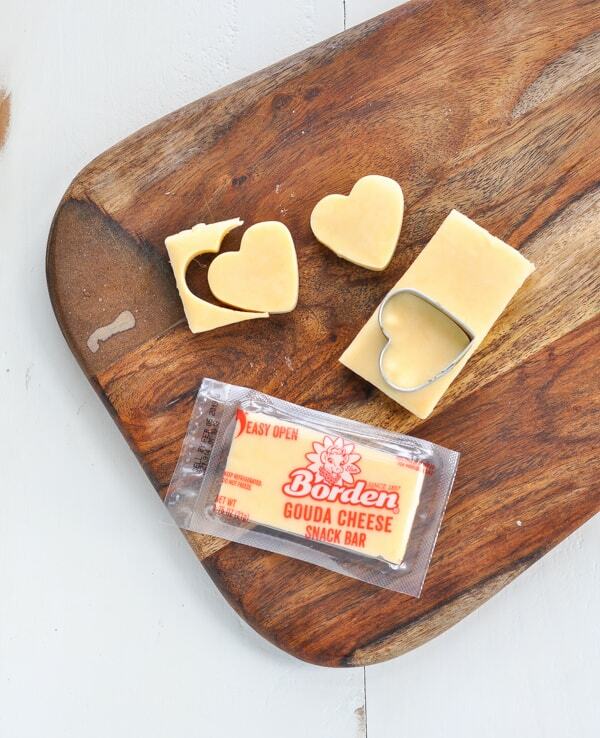 Cut 3 Borden® Cheese Snack Bars into thirds. 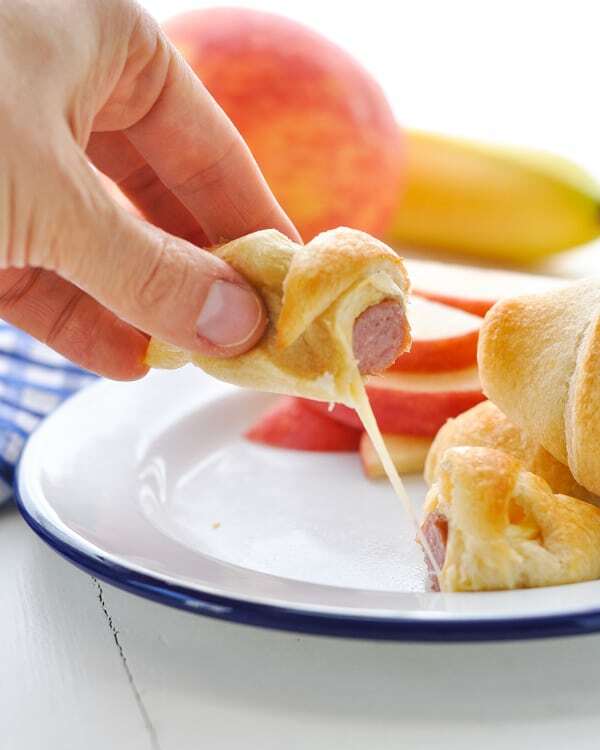 Place one piece of cheese and 1 miniature hot dog (or cocktail wiener) on the wide end of a triangle. 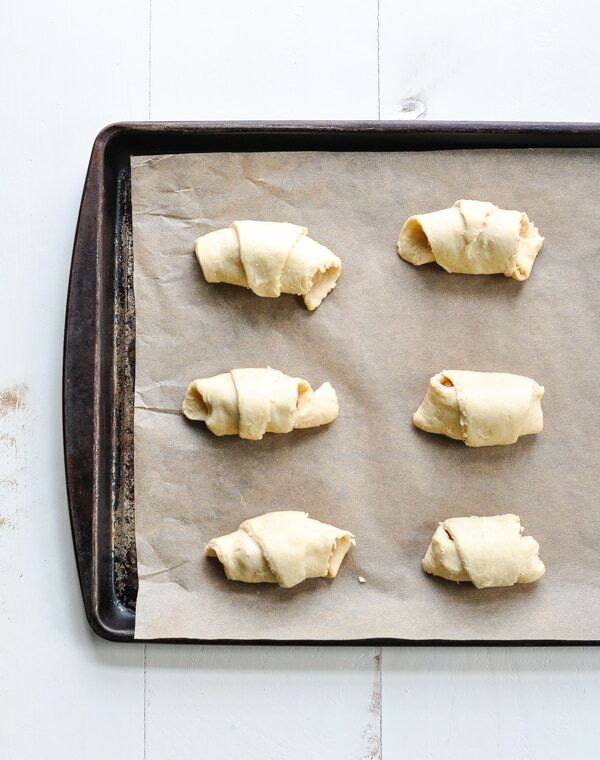 Roll up the dough, place on a baking sheet, and repeat with the remaining triangles. Bake at 375 degrees F for 9-11 minutes, or until they’re nice and puffy, golden brown. Look at the gooey, melted cheese inside! 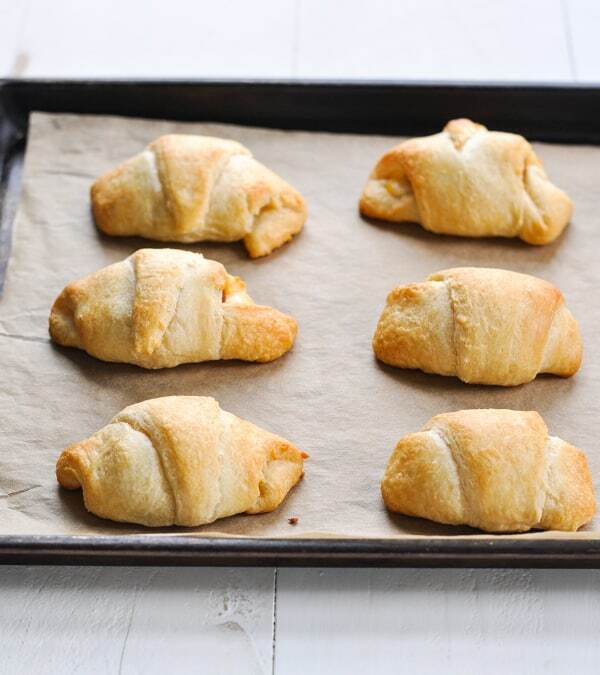 Unroll crescent roll dough and separate into 8 triangles. 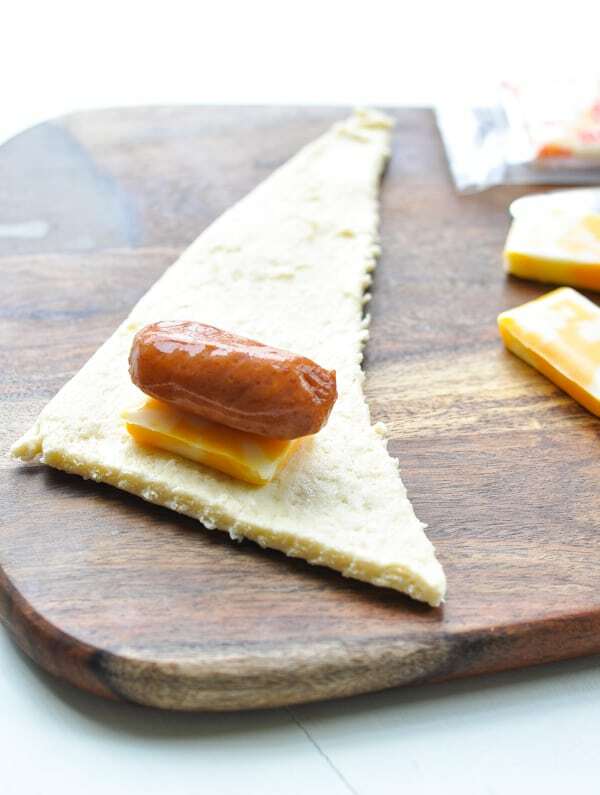 Place 1/3 of a Borden® Cheese Snack Bar and 1 miniature cocktail wiener on the wide end of a triangle. Roll up the dough and place on a 9 x 13-inch baking sheet. Bake rolls for 9-11 minutes, or until golden brown. As you can see, there are so many options and so many different combinations to keep snacks and lunches interesting — especially when you stock your kitchen with easy, packable ingredients. 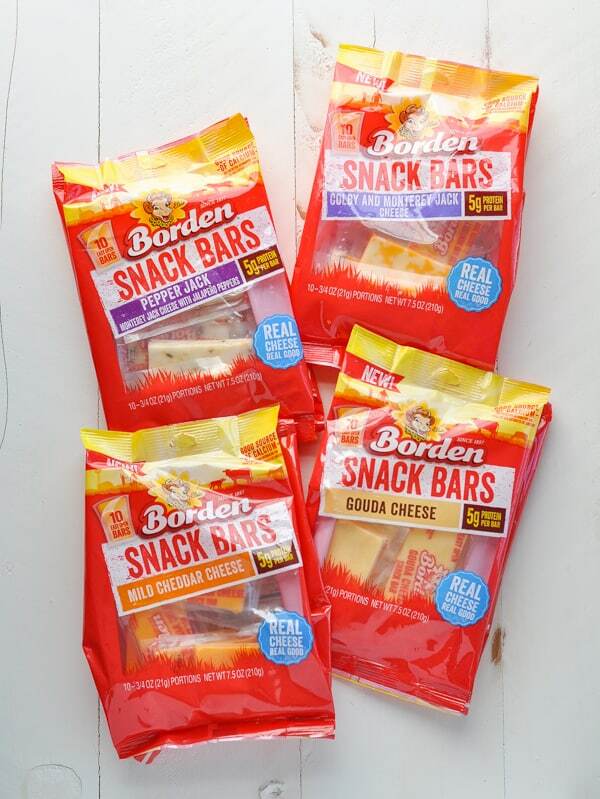 Combining convenience, nutrition, and flavor, the Borden® Cheese Snack Bars are available in a variety of wholesome, creamy flavors including Mild Cheddar, Colby Jack, Pepper Jack, and Gouda. Which one sounds best to you?! Which bar will you pack for your kids next? 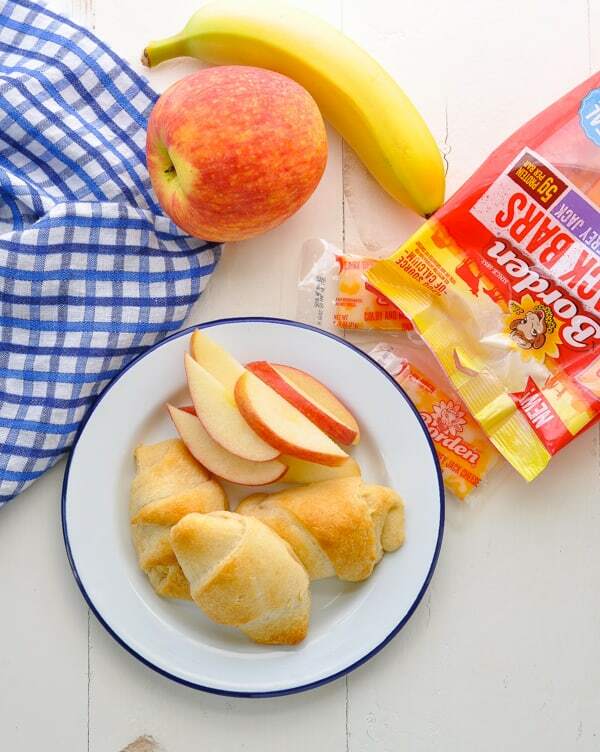 I hope that these quick snack and lunch ideas make your back-to-school season a lot easier and even more delicious! Hey Blair! Good job on this article! I was looking for some quick recipes for snacks for my little nephew, so I tried making a couple of the 3-Ingredient Cheesy Crescent Dogs for him. To my surprise, he really enjoyed them; he usually don’t like what I make. 😂 I just wanted to thank you Blair for sharing this post. It was a big help!